Last Monday our prioress put out a note to all sisters announcing a collection for Haiti that would go there through Catholic Charities. The offer also went to our lay employees and friends. She also stated that the community would match whatever is donated. As of Friday there was over $2,000 already in. Would be nice to get to a total of $5,000. We have been including Haiti in our prayer intentions almost every day at Morning or Evening Prayer. On the home front there are also difficult things. In our Sunday paper yesterday there was a cover article on the homicides in the Erie area for 2009. There were four; all men---average age 32. I was wondering about that because we knew that it had been a long time since we'd had a homicide and a Take Back the Site for Nonviolence vigil. Then in the last week of 2009 and the first week of 2010 don't we have two homicides close together. The last one in 2009 was a "domestic dispute," one of the common reasons for violence. A 42-year old man was killed by his longtime girl friend. The one pictured below was very sad. A 17-year old shot a 19-year old. Another common situation: disagreements and arguments that are brought to a head on the streets. A couple things made this one memorable. First, the girl friend of the slain boy, and mother of their baby, was a participant in two of our programs when she was in elementary school: the Art House and the Kids Cafe. And secondly, both of the boy's parents spoke at the vigil. The mother in particular has decided to start a local campaign of speaking in schools and to youth groups to share their experience and try in her own way to get guns off our streets. 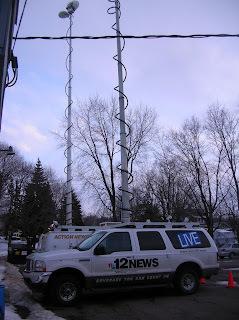 You can also see from the second photo that it got a lot of media coverage, two TV mobile vans were set up there. There was also a very large crowd...75-100, with many sisters from the vigil sponsors (Our community, the Mercy sisters and the Sisters of St. Joseph) and many others--individuals and local groups that are speaking out and making appearances at events such as these that call for an end to violence. Our BFP committee (Benedictines For Peace), that helps coordinate these vigils, has recently renewed its website.